Set up our PayPal integration and grow your Mailchimp audience with new customers and their purchase data. You can use this data to send targeted campaigns with exclusive offers and include a custom button that links directly to your PayPal checkout page. In this article, you'll learn how to connect and use the PayPal integration, and how to add PayPal buttons to your Mailchimp campaigns. The PayPal integration is not available for new downloads at this time. If you use a shopping cart application that processes transactions through PayPal, as opposed to using PayPal directly, the PayPal integration may not work for you. You need a PayPal Business or Premier account to use the integration. PayPal screenshots in this article may differ from what you see in your account. 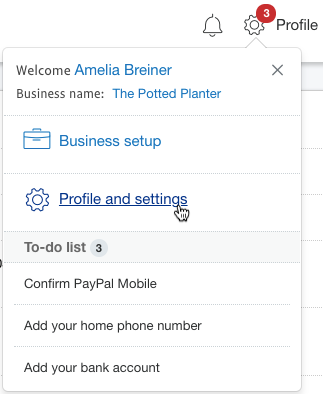 Pay special attention to your audience field settings and merge tag labels when you connect PayPal to Mailchimp. Mailchimp can't recognize PayPal data unless your merge tags are formatted correctly. Our PayPal integration only connects to one audience. 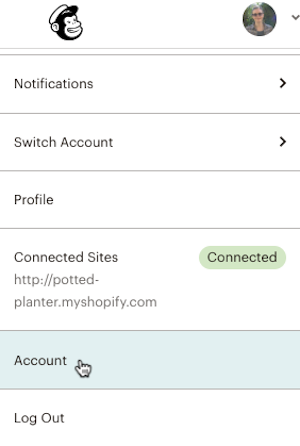 To link your PayPal account to more than one Mailchimp audience, connect them using Zapier instead. The connection status in your account will display as Not Connected until someone makes a PayPal purchase. This integration doesn't support Mailchimp's API 3.0 features at this time. Each time someone new makes a payment in your PayPal Business or Premier account, we’ll add them to your audience as a subscribed contact. Their data, including their PayPal purchase information, will sync with your Mailchimp account. You can then use this data to build segments and create targeted campaigns. If you want the integration to pull over additional data, you'll need to format your audience fields and merge tags a specific way. Your Mailchimp fields must be text fields, instead of address or zip code fields. The zip code field type will work for customers in the United States, but the text field is flexible for international customers. Each piece of PayPal customer information corresponds to a merge tag in your audience. 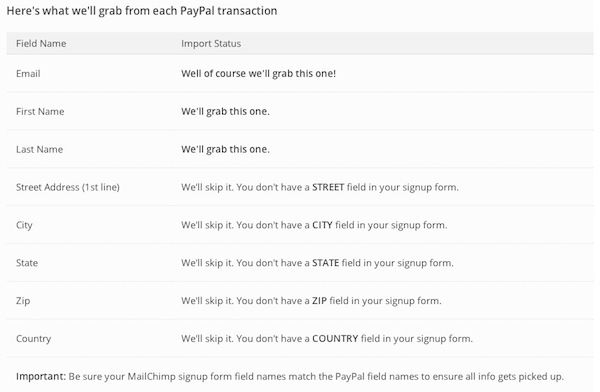 Here's the data that PayPal collects and the corresponding Mailchimp merge tags you need to use. To add a new audience field that accepts PayPal data, follow these steps. Click Audience fields and *|MERGE|* tags. Click Add A Field, and choose the text field type. Input a Field label, and name your merge tag according to the table. In this example, we'll label the field as Street Address, and the corresponding merge tag as STREET. Repeat steps 5-6 for each field you want to add. After you create your new audience fields, we'll match them with new customer data. To connect the PayPal integration, you'll get the notification URL for your Mailchimp audience and add it to your PayPal settings. This will sync your Mailchimp audience with your PayPal account. To find the notification URL for the audience you want to sync with PayPal, follow these steps. 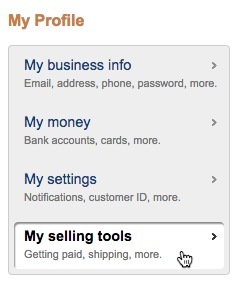 From the list drop-down menu, choose the audience that will store your new PayPal customers. Review the information that will be transmitted to your audience. If you want to sync information that requires a field that's missing from your audience, add the field and restart this process. Highlight and copy the Notification URL. Next, you'll paste this URL into your PayPal account. To paste Mailchimp's Notification URL into PayPal, follow these steps. Click the Profile icon in the upper-right corner and select Profile and settings. In the Getting paid and managing my risk section, click Update next to Instant Payment Notifications. Click Choose IPN Settings. If you already have an IPN set up for the account, click Edit settings. Paste the Notification URL in the Notification URL field, and click Receive IPN messages (Enabled). Your PayPal account is now linked to Mailchimp. The connection will not be verified until Mailchimp actually receives data from PayPal. To test the integration, make a purchase in PayPal. You can reach your audience in multiple ways with Mailchimp. Add a button to your email or landing page and link it directly to your PayPal product page to streamline transactions. Use our drag-and-drop button content block, or create your own PayPal Buy Now button. Find out everything Mailchimp has to offer in these guides. You do not need to set up the PayPal integration to create a campaign button. If you need to disconnect the integration at any time, turn off Mailchimp's Instant Payment Notification (IPN) in PayPal. To disconnect the integration, follow these steps. Click the Profile icon in the upper-right corner, and choose Profile and settings. In the Getting paid and managing risk section, Click Update next to Instant Payment Notifications. On the IPN page, click the Turn Off IPN button. In the pop-up modal, click Confirm. After the IPN is turned off, the PayPal integration is disconnected from Mailchimp. The PayPal logo will remain highlighted on the Integrations page in your Mailchimp account, but it is disconnected. If you have issues during the setup process, or if new PayPal customers aren't added to your Mailchimp audience, take a look at our troubleshooting guide. The Button content block creates a graphic in your campaign linking to a URL or file. Learn how to add and change the style and settings for them.